Dogs for Good is delighted to announce that Digby, a twelve week old, golden retriever cross Labrador puppy has joined the ITV This Morning show today and will be making weekly appearances on the show over the next twelve months. This puppy may just be a cute bundle of fur right now, but he’s destined for great things. Charity Dogs for Good makes life changing differences to people with disabilities through specially trained dogs. The charity’s assistance dogs support adults and children with a range of disabilities and also children with autism. In addition, the charity’s community dog service trains activity and therapy dogs to work with specialist handlers in a variety of settings including hospitals, in social care and schools. The charity’s Family Dog team also gives specialist advice and support to help families with a child with autism get the most out of their relationship with their pet dog. 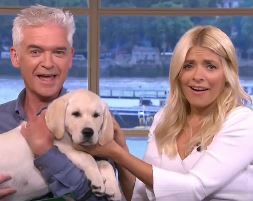 ITV This Morning viewers named the Dogs for Good puppy live on the show today. Digby will be puppy socialised by Helen Townsend, an experienced Dogs for Good volunteer who has already socialised four puppies for the charity – resulting in Helen having volunteered for nearly 2,000 days caring for young pups. Helen will accompany Digby to the ITV This Morning studios each week and over the next year and when Digby’s not taking a starring role, Helen will be helping him to learn about the world around him. Together the pair will be visiting supermarkets, restaurants and other busy places, travelling on buses and trains – in fact all the sort of places that Digby might go as a working dog. Helen will also be teaching him all the important basic obedience training to ensure he’s a polite, relaxed and confident dog wherever he goes. Digby was bred by Dogs for Good’s own breeding scheme. The charity breeds from a small number of dogs who live at home with volunteers and given additional care and support by the charity’s puppy team. Dogs for Good trains mainly golden retrievers, Labradors and first crosses of the two as they tend to be the breeds most suited to working as assistance dogs. The charity has developed its own breeding scheme to help find pups with the right temperament and characteristics to become assistance dogs and all the pups and mum are regularly health checked and screened. Digby was part of a litter of nine pups, four of whom will stay with Dogs for Good while others have gone to become assistance dogs at other charities. If all goes well with Digby’s puppy socialising, he will begin his formal training to become an assistance dog at around 15 months of age. 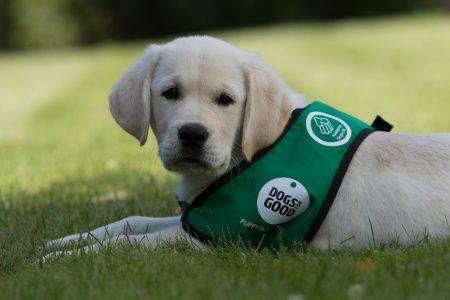 Dogs for Good has a national training centre in Banbury, Oxfordshire where all Dogs for Good assistance dogs and community dogs receive around six months training before they are placed with a disabled child or adult or a child with autism to help them live life more independently. Each year, Dogs for Good receives more than 2,000 enquiries from people who would like support from a trained dogs but currently the charity is only able to help a small proportion of those who would like assistance as they are reliant on donations and receive no government funding. Find out more about our work.